This classic story first published in 1930, is still one of the best selling children's books of all time. It's often one of the first books added to a baby's bookshelf and a popular baby shower gift. This book's messages are timeless.... believe in yourself... keep trying. While there have been a number of different versions of the illustrations, the story has remained the same with each new publication. Your child will not only relate all the toys the train carries, but also to the problem and ensuing struggles the train encounters. 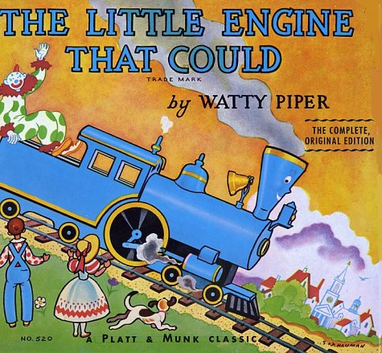 Before the story is over both you and your child will be cheering for this little train's success. The train carrying toys was a happy train. How do we know this? What number is on the first car of the happy train? List all the toy animals that were on the train. What were your three favorite toys on the train? What does it mean when the author says that the train stopped with a jerk? The shiny new engine was a passenger engine. What does a passenger engine carry? Why did the Little Blue Engine decide to help? What did the Little Blue Engine say to help her get over the mountain? How could you use this chant to help you with something you do? This bundle includes flashcards, a shared writing activity, a story elements learning page and ideas for extending the learning beyond your home. ​It's just a quick download and you're ready to use it with your child. 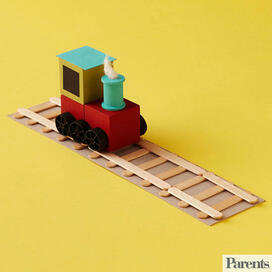 Go to Parents Magazine and check out the easy instructions for making this train engine and tracks. Here's my idea for customizing this craft...challenge your child to create additional train cars that resemble those in the story. Maybe even include faces on the train cars or add toys similar to those in the story. Sure you can go out and buy a train set, but isn't it so much more empowering for your child to build one for herself? 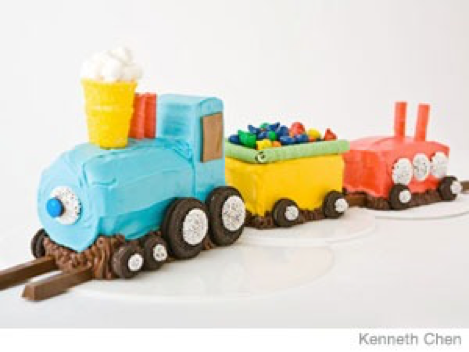 This special cake creation was found within the Parenting Magazine website. The complete instructions are found on the site, just click the link above. Consider making this a joint effort by including your child in the shopping for all the special treats needed to make this train truly come to life. Another idea would be to use engine colors similar to those found within the pages of the book.